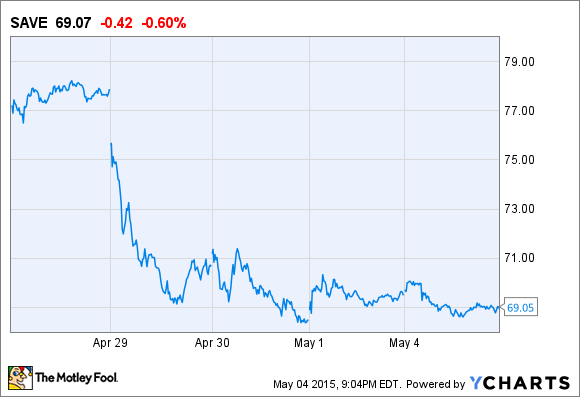 Spirit Airlines stock is down, but it is likely to bounce back relatively soon. Budget carrier Spirit Airlines (NYSE:SAVE) reported Q1 earnings last week, and it got punished for modestly reducing its full-year margin guidance. Spirit Airlines stock has dropped more than 10% over the past week, and is down nearly 20% from the all-time high it set late last year. Spirit Airlines one-week price chart, data by YCharts. Long-term investors should consider using this pullback as an opportunity to invest in Spirit Airlines. Since completing its IPO in 2011 at $12 per share, Spirit stock has had several major corrections -- each of which would have been a good time to buy. With Spirit continuing to report strong margins and rapid growth, this time may be no different. Spirit's total revenue per available seat mile, or TRASM, fell 9.9% year over year last quarter. Generally speaking, airline investors want to see TRASM growing, as it means the airline is getting more revenue for every unit of capacity. Spirit attributed 40% of the decline to the impact of its own rapid growth -- it grew capacity 25% year over year in Q1. Another 35% came from "fare compression" as cheaper fuel encouraged more growth and discounting by competitors like Southwest Airlines (NYSE:LUV). The last 25% was specific to Dallas, where industry capacity has skyrocketed since Southwest began a rapid expansion at Dallas Love Field last fall. Despite this TRASM pressure, Spirit improved its adjusted pre-tax margin by 9 percentage points compared to Q1 2014. This drove an 87.1% increase in adjusted net income, which reached $70.7 million. On the company's conference call last week, Spirit Airlines executives told investors that the recent bout of unit revenue pressure would continue in Q2 before potentially easing in Q3 and Q4. TRASM is likely to decline 14%-15% in Q2, with the sequential decline driven by tougher comparisons to 2014. As a result of this revenue outlook -- as well as a modest increase in fuel prices -- Spirit updated its full-year operating margin guidance to a range of 24%-27%. This represented a somewhat less bullish forecast than the previous operating margin guidance range of 24%-29%. Obviously, investors would have preferred to see steady or improved financial guidance. However, even the bottom of Spirit's guidance range would represent a big improvement from its 2014 adjusted operating margin of 19.2%. Despite the recent trend of fare compression, Spirit's long-term outlook remains very bright. At least two of the recent revenue headwinds it has faced will dissipate over time. First, while Spirit expects to increase capacity more than 30% this year and is on track to grow capacity by at least 20% in 2016, its growth rate may moderate thereafter. Since new routes tend to be less profitable than established ones, a slower growth rate would likely improve Spirit's unit revenue by increasing the proportion of mature routes within its network. Second, Southwest Airlines' rapid growth in Dallas has been a major headache for every other carrier with a big presence in that market. Southwest's capacity is already up more than 150% since last fall, with more increases planned in the next few months. Southwest's rapid growth in Dallas has been a noticeable drag on Spirit's unit revenue. However, the market is quickly absorbing those capacity increases. This should allow Southwest to raise its average fares in Dallas over the next year or two. That in turn will give Spirit more leeway to increase its own fares again. Meanwhile, Spirit's cost structure will continue to decline. The company has projected that non-fuel unit costs will fall 6%-8% in 2015 thanks to its growth, a shift toward larger planes, and the availability of cheaper debt financing. These trends will continue in 2016, though the unit cost declines are likely to be more modest. In short, Spirit Airlines is well positioned to maintain or even expand its already-generous profit margin while continuing to grow at a healthy clip. With the stock trading for less than 14 times projected 2015 earnings -- a discount to the broader market -- Spirit Airlines' shares are almost as good a deal today as its airfares.